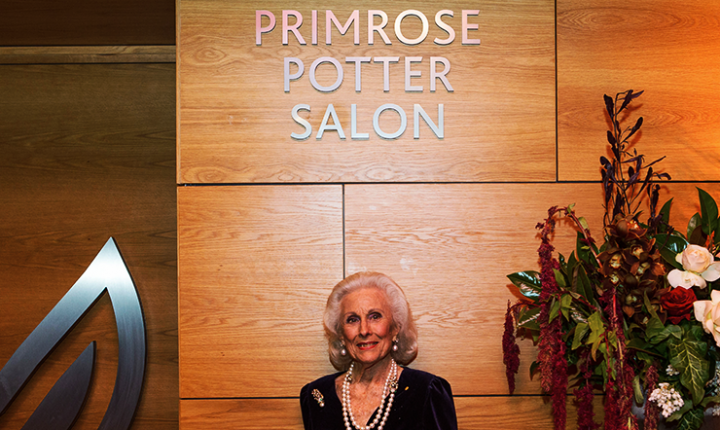 Melbourne Recital Centre today renamed the smaller of its exquisite performance spaces the Primrose Potter Salon, honouring one of Australia’s most generous and passionate arts patrons, Lady Primrose Potter AC. The inspiring philanthropist has made one of the most substantial gifts ever received from an individual to Melbourne Recital Centre as part of its anniversary celebrations, to support the unique performance platform provided by the Centre’s Salon for Australian artists at all career stages. The gift comes on the eve of the 10th anniversary of the Centre’s opening in 2019. Lady Primrose Potter’s extraordinary contribution to the arts and the Melbourne community is well known, and she has generously supported a range of the Centre’s educational and outreach programs since 2014. The Primrose Potter Salon is the Melbourne Recital Centre’s performance space for nurturing artists and building audiences, presenting a diverse program of around 250 intimate classical and contemporary concerts and events each year. The 140-seat Salon provides hundreds of emerging and established local artists with a valuable platform to share and perform their music to audiences of all ages and backgrounds. The Salon is also an important performance and workshop space for children as well as providing a platform for the master class program with local artists learning from international performers. In 2019 the Melbourne Recital Centre celebrates its tenth anniversary. Continuing its presence as the music heart of Melbourne, an exciting and adventurous program will be announced in late 2018 as part of the celebrations.